All our rooms are nicely furnished ideal for couples or friends travelling together. All the rooms have access to the well equipped guest kitchen, and free internet. All the apartments have their own kitchen.Our English speaking staff will do their best to make sure your stay at our Hostel is going to be a pleasant and memorable one. We will provide you with all the information you might need to see everything in our city, either if you want to visit the historical sites, experience our cultural events or want to party in a great club, we will help you find the right place. Also very important: Our Hostel is a calm quiet place to stay so please no loud parties or drinking in the Hostel during the night. We’re located in the city center - in the old Jewish district – that happens to be the cultural and entertaintment zone of Budapest. I thoroughly enjoyed my stay at AVAIL Hostel in the heart of the Jewish area. Thank you Sándor. best location ever, clean, and definitely one of the best hosts! Sandor was really helpful and showed us everything to be done around Budapest in detail, always making sure that everything is alright as well. :) Thanks Sandor! Great location and great recommendations! My sister and I visiting for 4 nights for my birthday. It was absolutely incredible. Sándor is beyond accommodating and such an amazing host. If we go back/ when we go back we will 100 percent stay there again! Great location! Great host! Great things to do! Sandor the host is really a great guy. He's like the walking dictionary of Budapest. Always keep in touch with you and make sure your stay is as comfortable as you can. If I had to nitpick, it will only be the bed sheet could be newer and because you stay right smack in the middle of partying place, you might get woken up by other occupants coming back late from party. I thoroughly enjoyed my time at this hostel. The room and bathroom were very clean and comfortable. 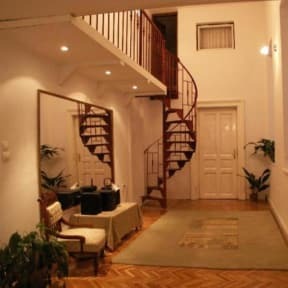 It's in a wonderful location, close to public transport and all that Budapest has to offer. Sandor was very helpful with recommendations of what to do and where to eat. I just started using hostels on this trip to Europe and I think this place set the bar high for future bookings. The host is amazing in helping ensure you know what the city has to offer, the place is in the heart of the night life, and the house is beautiful. The rest of the reviews say it all! The two best parts about this hostel are Sandor and the cleanliness. The rainfall showerhead in the shared bathroom doesn't hurt either ;). Sandor gave me a 45 minute overview of the city and an overview of the best way to spend my limited time in the city. This is where I'm staying the next time I go back to Budapest! Thank you, Sandor, for making my stay in Budapest so pleasant. I never had such a lovely host before and he made everything to create a home for me during my time in the city. He picked me up from the train station and gave my a lot of helpful informations. The location of the apartment is amazing, in an exciting neighborhood, and everything is in walking distance. The rooms are cozy and in general the apartment is very clean, the kitchen well equipped and the bathrooms are very nice as well. Avail hostel is a set of private guestrooms in the very heart of old Budapest town. The building is historic and beautifully old. The inside is however modern and comfortable with a well equipped kitchen and basic but very comfortable rooms. The most wonderful thing though is the host, Sandor, a very friendly and helpful host who goes out of his way to welcome and assist you in any way, and gives an amazing amount of guidance and information for how to enjoy the city. Thank you so much.